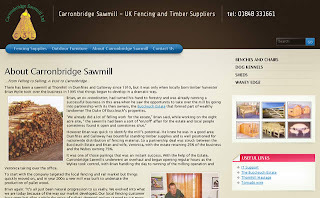 Carronbridge Sawmill has its own pressure treatment tank at Carronbridge, Thornhill so timber products can get the green treatment. This is a more eco-friendly method of preservation. Wordpress is interesting to develop with especially with the wide range of themes and powerful blog (originally) engine driving the resulting websites. Callisti is looking forward to developing and submitting some themes for general use to the wordpress community in the new year.